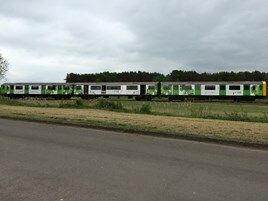 Vivarail’s prototype Class 230 D-Train is now running as a three-car unit. Both driving cars are fully powered and the four gensets are running successfully. Apart from interior fit-out of the trailer car, the rest of the train is complete. Currently, the prototype is the only train that will be built until an order is placed for operational units. “We continue in discussions with London Midland and are ready to start building new trains for them as and when an order is placed,” Vivarail spokesman Alice Gillman told RAIL. For much more on the D-Trains, read RAIL 803, published on June 22. If London Midland are having to use some of the Class 230's. What about other train operators such as GTR Southern, Abellio Greater Anglia and Great Western Railway that are bidding to have the Class 230's. Be good if Abellio GA could get some Class 230's to be used on the Ipswich-Lowestoft, Ipswich-Felixstowe, Norwich-Cromer-Sheringham, Norwich-Great Yarmouth, Norwich-Lowestoft, Norwich-Peterborough via Ely, Norwich-Cambridge, Ipswich-Cambridge, Ipswich-Peterborough via Ely and Marks Tey-Sudbury lines in East Anglia to replace the Class 153's and Class 156's for East Midlands Trains or Great Western Railway and Class 170's for East Midlands Trains, Great Western Railway or GTR Southern (Class 171's). I think the 230s should be used by Arriva Trains Wales or the new franchise company on Welsh & borders 2018 on the Bidston - Wrexham Line 30min service.